A note on the track map. 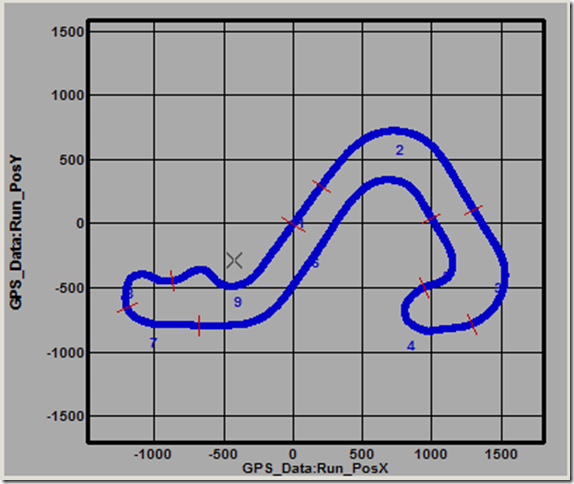 I’ve divided the track into segments with each segment beginning just prior to the start of each major braking zone. Note that there is a section marker at the S/F line…that makes section 1 simply the end of the front straight. Not very interesting and not really eligible for direct improvement by itself. What happens in 1 is simply an extension of what happened in 9. So, in the discussions below, I essentially ignore section 1. For the first session of the day, I had an instructor ride along (Brian). Brian was very helpful and encouraging. At the end of the session, he showed me a different line through big bend that would prove effective later in the day. He had me step away from the outside of the track over to the first seem. Then drive straight at the edge of the track, braking just until the car reaches the edge of the track. THEN, begin to turn in. I didn’t really get this until the last lap or so…but, I worked on it throughout the rest of the day. I elected to run the rest of the day solo. I really need to figure out an optimal instructed/solo plan. Looking back at this day, I wish I’d had (at least) one more session with Brian, to work on a few more details. But, as I’ve noted before…its a very different experience driving the car without an instructor in the car and all responsibility rests with you. Unconciously, I still defer too much decision making to the instructor when one is in the car. I just drive different. I feel like I need to get comfortable driving the car alone, too. I’d almost rather spend the first session solo, in order to get my bearings…and then have the instructor ride along in session 2…so, I can ask questions on certain details AFTER I’ve reoriented to the track (in cases where the track isn’t new to me). In this session I was starting to feel comfortable in the car and with the new lines. I was starting to be able to pay attention to what I was doing and where. I didn’t feel so “in the moment”, but rather was aware of planning for the next lap. You can see it in the lap times, as they are starting to come down, and there were two laps below 1:38. Plus, my optimal dropped below 1:37. This is the first session that hap some of my best segment times for the day. By session 4, I felt like I was getting it. This was my second best session of the day (second to session 6). All but two laps were below 1:38 with a best lap of 1:36.4 and an optimal sub 1:36. Plus, laps 2-6 were pretty consistent to boot. I felt like this session didn’t go particularly well. I think I was overdriving it, there is a lot of inconsistency in the lap times. However, the one thing that did go well in this session was that I began to get a feel for “smooth” in the car. Particularly during entry. I felt much better on entry to fast sweepers (big bend (2), Tombstone (3), and Ricochet (6)). I’m still pinching my exits and loosing speed that I carry into mid-corner. I’m sure that I can take Ricochet flat…just don’t have the balls to do it, yet. I was having to open the wheel to let the car drift to the rumblestrip. I’m sure I could take it flat and hold a steady wheel. In this session I experimented with a different line through Horseshoe (section 4). My classroom instructor suggested trying a double-apex line through this section. It felt good, and I seemed to be catching cars quickly in that section. But, it doesn’t show in the segment times. Might take some more practice to more completely evaluate. It seems like it would be a better racing line, as it protects the inside. I forgot to start the camera for this session, so no video. While session 4 was the most consistent of the day, this session produced my second and third fasted laps of the day, and my fastest theoretical lap in a single session. I really got the hang of the double-apex through Horseshoe as I recorded my fasted time in that segment for the entire day. There is definately more time to be had through that section. Below is a table of the fastest theoretical laps from each session 2-6, and my fastest theoretical lap for the day across all sessions, excluding session 1. My fastest single lap was a 1:36.443 (session 4/lap 3), my fastest theoretical in a single session was 1:35.419 (1 second faster) in session 6. And my fastest theoretical for the day was 1:34.609…another 8 tenths faster than the session 6 theoretical. Looking at the trends of the day, there isn’t really any slope to my times as the day progressed. So, I don’t think that increasing track temp played any role which would invalidate mixing and matching sections from sessions below. In other words, I think that the 1:34.4 would have been possible in any given session….once I figure out how I ran each of these fastest segments. So, what did I do in each of these fastest corners? Segment 1(front straight): nothing to say here. Shift into third gear at redline. Segment 2 (Big Bend): Enter with car straddling the left seam. Drive straight to a dark patch on the outside of the corner, slowing to about 72mph as I reach the dark patch. Turn the car onto the arc headed for a late apex, and get back into the throttle as I reach the dark patch. Since my entry speed is only 83mph or so, this is really only a brief brush of the brakes starting at the end of the rumblestrip, and a quick return to WOT at turnin. As mentioned above I still need to stop pinching the exit so that I can take advantage of the higher entry and mid-corner speed and convert it into exit speed gaining time down the following straight. Comparing this lap to previous laps you can see the higher entry and mid-corner speeds…but, by exit previous laps are within 1mph of this lap. Most of the time was gained from braking zone to exit. Times down the following straight were very similar. Segment 3 (tombstone): Throughout the day I continued to back this corner up farther and farther to tighten up the arc between the apex and exit of tombstone, and reduce the arc from the exit to the apex of boothill. Early in the day I was driving deeper into this corner braking harder, and turning later/steeper. This put excess G load onto the BootHill apex, and less load earlier in the corner. This was clearly slower by 2-3 tenths. 83mph entry, brakes at start of rumblestrip. Off brakes mid-point of rumblestrip, 75mph. Turnin as brakes release, WOT, 3/4 down rumblestrip, 72mph @apex. From the data it looks like I’m still only carrying 0.8-0.9G rather than the full 1.0 that I’ve seen in other corners. So, I should be able to carry another 2-3mph, and gain another 1-2 tenths. I’ve noticed by the time I reach the end of this segment and the car is fully loaded up the rear is just starting to let go a hair before the front. This gets worse throughout a session, so I may need to alter rear air pressure…and also perhaps rear camber. The car feels good in tight-slow corners with the current bar setup. Segment 4 (Horseshoe): (double apex line) Hold the wheel steady and let the car continue the arc from Tombstone/Boot Hill. Hold this arc until the nose is pointed at the inside curb of Horseshoe. Straighten the wheel and brake [TBD: need visual reference] to slow to 50mph at the crest. Tight to the curb, and then let the car run wide to the first seem. Tighten the arc to a late apex and return to WOT [TBD: need visual reference and apex marker]. I’m pretty sure that the braking zone can be carried deeper, and probably can be carried over the crest through the first apex. The line through the first apex is pretty straight, so if the brakes were eased as the car passed the crest, then they could be increased again once the car settled as it passed the first apex. Segment 5 (Buzzard Neck): The exit from Horseshoe leaves my LHS wheels on the left seem, and I just hold the exit arc until the car is back to track-right. Aim about 3 car lengths before the end of the rumblestrip. As the car crosses the RHS seem lift briefly and begin to turn back left so the arc will clip the rumblestrip about 2 car lengths before the end. Go WOT at this point. Apex is at the point where the nose is pointed at the RED houses on the outside of Big Bend. Entry speed: 55 mph, apex 50 mph, exit 55mph. There is a bump on the exit. It usually doesn’t upset the line. In case it does, straighten the wheel just before the car reaches the bump. It shows as a slightly dark patch right in the exit path. Segment 6 (Little Bend+Ricochet): The braking zone starts at the mid-point of the rumblestrip. There is a large dirt bare-spot, and the braking zone begins right at the start of this dirt spot. Entry speed is 71mph. Braking zone ends and turn-in starts at the end of the rumblestrip. It may be possible to carry this a little deeper beyond the rumblestrip. Apex is the point where the nose is pointing directly at the covered staging area. Let the car track out, don’t pinch it down. For ricochet, just lift (no brakes) at the start of the rumblestrip, get back WOT about 50 ft from the end of the rumblstrip. This takes about 1 second of track time. Then turn-in for a neutral apex as you roll on the throttle. A little curb this direction doesn’t hurt, and can be a good thing. I think it might be possible to carry this with even less lift, or maybe none at all. Might be better keep the trottle open and brush the brakes. entry 83mph, turnin 80mph, apex 75, exit 76mph. The following section was deleted by my editor. So, I’m working on reconstructing it. Grrr…. The braking zone starts 50 feet before the start of the rumblestrip—there is a small dirt patch on the outside of the track that marks this point. Additionally, there are some trees beyond the ridge in the 1.3 section of the track. These are not visible until JUST at the start of the braking zone. The braking zone ends just before the break over as the track descends, about 50 feet beyond the start of the rumblestrip. The gas station at the track entrance is visible from this vantage. Extending a line from that gas station in the distance back to the inside curbing intersects with the apex point. Turn onto this line while rolling off the brakes. Modulate the throttle to maintain speed. Once the apex has been reached begin to let the car run wide. Roll on more throttle and let the car push to the outside of the track. As the Holiday Inn comes around onto the nose of the car the car should be approximately mid-track. Continue to hold the turn, and modulate the throttle until the nose is pointed at the end of the outside rumblestrip and the car is lined up over the outside seem, this should be 100 feet from the end of the rumblestrip. Straighten the wheel slightly, prepare to downshift, and brake. Heel-toe shift to second completely the shift before the end of the rumblestrip. Get back on the gas as soon as the shift is completed. Turnin starts at the end of the rumblestrip, turn onto the line extending from the flag stand to the inside curbing arcing for a late apex. Hold the turn just to keep the car mid-track until the car reaches the start of the curbing for the second turn. Begin to roll the wheel back to the left at this point. I can clearly carry more speed through here. Even my best pass through here I only managed 0.9g…these tires have consistently shown 1.05g is there limit. Given this ratio, I should be able to increase these speeds by 3mph. Given the same braking, I should be able to brake 30 feet later. This point occurs RIGHT at the point that the end of the rumblestrip is in view. But, the downshift must occur less than 1 second after starting to brake. The apex is just at the top of the hill. Turn the car to get the left wheels up onto the curbing. Hold the car on the curbing and drive onto the rumblestrip. 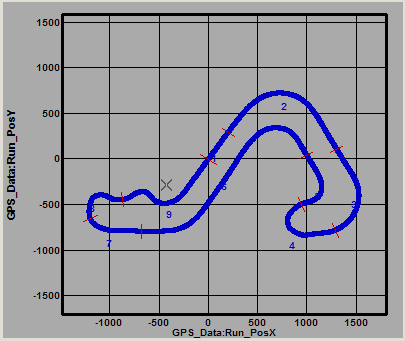 Follow the curve of the outside of the track. The braking zone for the second half of rattlesnake starts at the point where the rumblestrip straightens out. Braking ends at the end of the rumblestrip. Turnin starts when the large/tall clump of trees beyond the track comes out from behind the inside curbing. The apex point is about 2 car lengths beyond a neutral apex. Again, hold the turn to keep the car mid track as the car runs abeam of the left-hand curbing. Roll the wheel back to the left aiming for a neutral apex. The apex occurs as the nose of the car is pointed at the left edge of the hay bales on the outside of the track. This turn is crucial for a good time in this segment. Unwind the wheel, and let the car run as wide as possible. Pinching here or a small wiggle will cost several tenths by the time you reach the start finish line.